This picture was taken by a very talented friend while we were in Karamoja, Uganda, in the summer of 2006. Baby Amy, in my arms, was very sick. 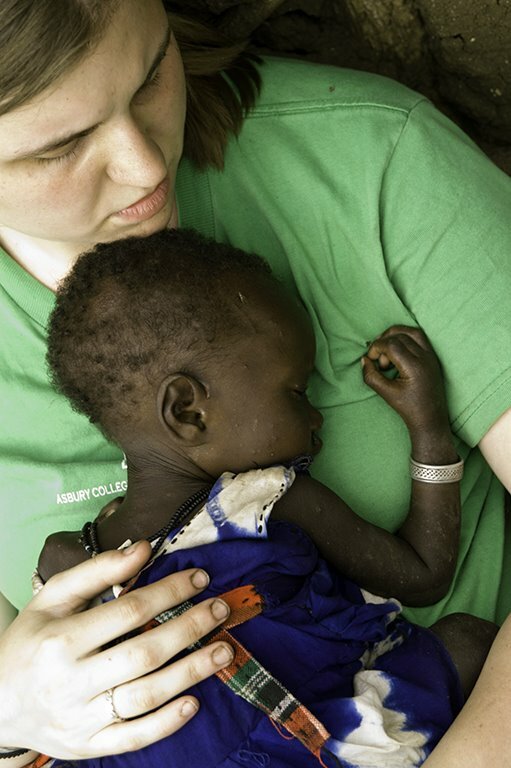 She was 18 months old, and suffering from malnutrition and probably malaria. I held her while her brother (probably under 5 himself and left in charge of her) colored Bible story pictures. She fell asleep right away. Probably in the top 20 moments of my life, easy. Copyright 2007-2016 Coral Rose G. All rights reserved. As Jesse and I prepare to become parents this fall I am seeking to remember all that I have learned from my single years as I heard my pregnant friends’ grand statements about their parenting styles which they went on to eat in the form of (not-always-so) humble pie later on. I don’t have any grand statements. We know nothing about being parents except that which is instinctual to being human. In fact, we are currently approaching parenthood with a humility that is rare (and refreshing!) for me. We plan to have a natural childbirth, cloth diaper and breastfeed. If these things do not happen, we will celebrate whatever birth method brings you into this world. We will change your diapers with love regardless of whether they are Huggies or bumGenius. We will feed you, regardless of whether we need to purchase formula or not. We love you. We will rejoice in the brilliance of what God is knitting together in my womb, and we will teach you to rejoice in the rest of what He has done. This world you’re coming to join is flawed, but it is not possible to worship its Creator while condemning all that He created. He created a world with languages as diverse as the cultures across the world. Yes, there is evil and hunger and war. There is also music and dance and art and literature. YAYAYAY!!! :) We’re all excited, too. Thrilled for you and for Jesse. And you’re brilliant and wonderful and you will both be great parents. Love you!! Oh, Buffy. We love you, too. Love this post. So few people realize that the important thing is not how you parent, but the fact that you get to do it at all. I feel like this is a blessing of the years of waiting and praying. I have had the chance to learn so much about thankfulness.